Making homemade pastrami is pretty easy, but it’s a rather time consuming process. Starting out with a brisket that has already been corned will take a few weeks off the process, but we still need to dedicate a couple of days to the project. Now, the first thing we want to do is soak the corned brisket in water to remove out some of the sodium that was absorbed through the corning process. A two to four hour soak is good enough for our tastes, but some people prefer to have it go as long as a couple of days while changing the water every few hours. You’ll need to do some experimenting to find your preferred method, but whichever route you go, just make sure the beef is fully submerged and refrigerated while soaking. To get the best flavor, you’ll want to grind the coriander seeds and peppercorns yourself. If you don’t have a dedicated spice grinder , then any run-of-the-mill coffee grinder will work just the same. Being the “As Seen On TV” junkies that we are, we prefer to use the countertop magician know as The Magic Bullet . 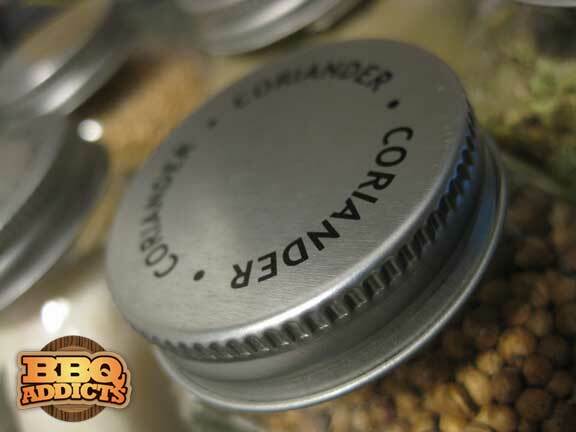 It churns out a freshly ground dry rub in 10 seconds…or less!!! 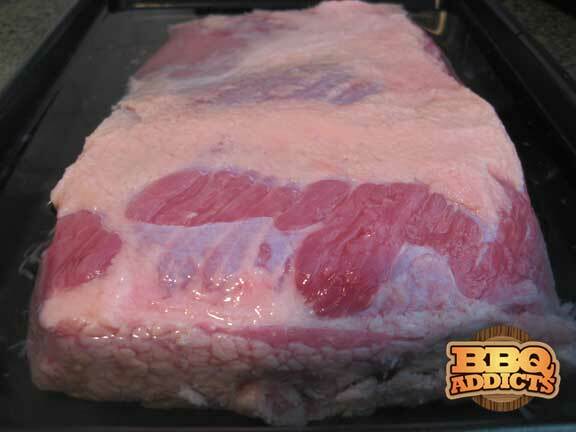 After your brisket has soaked for the desired amount of time, remove it from the water and pat dry. 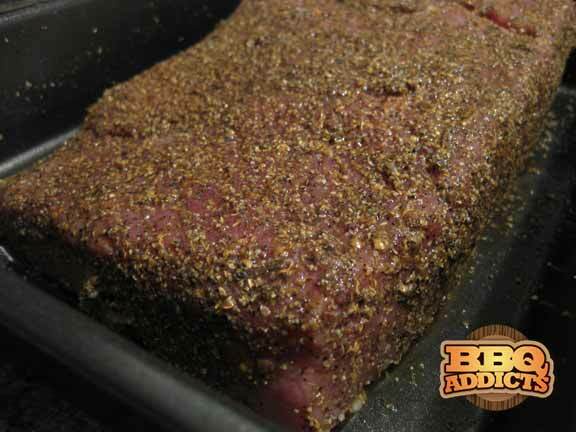 Now take your freshly ground dry rub and heavily coat the entire surface. We want the flavors of these herbs and spices to penetrate deep into the meat, so we’ll let the seasoned brisket rest overnight. Just wrap it up tight in plastic wrap and toss it in the fridge. The next day, remove your chilled corned beef brisket from the fridge and unwrap it. Place it in a 225 degree smoker until your Thermapen gives an internal temperature reading of 165 degrees. 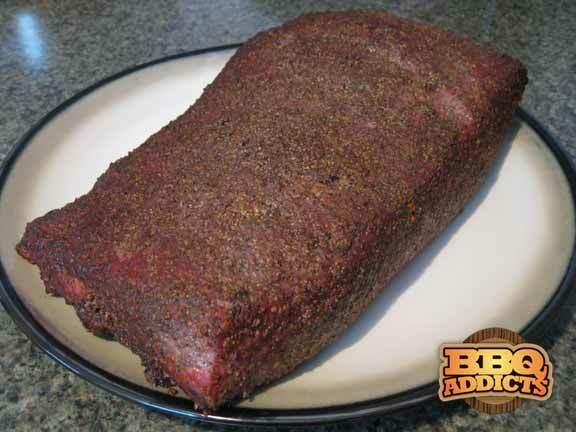 Pastrami has a lightly smoked flavor, so we only apply smoke for the first couple of hours. Typically one or two blocks of hickory wood is all it takes. After the quick smoke bath, we use only the residual heat from the fire to continue the cooking process. 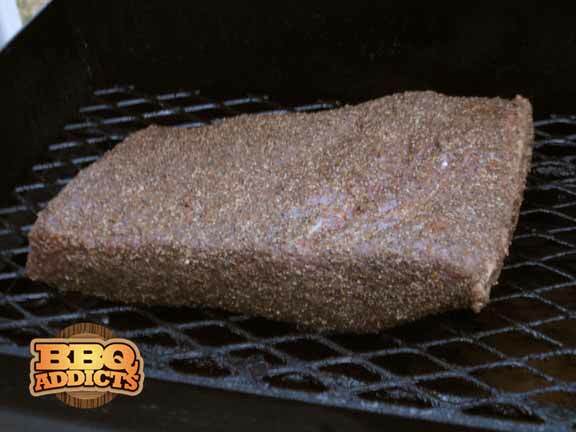 Like all briskets, the cooking time will vary depending on the size and tenderness of the cut. Stick with monitoring the meat’s temperature and your results will be much more consistent. 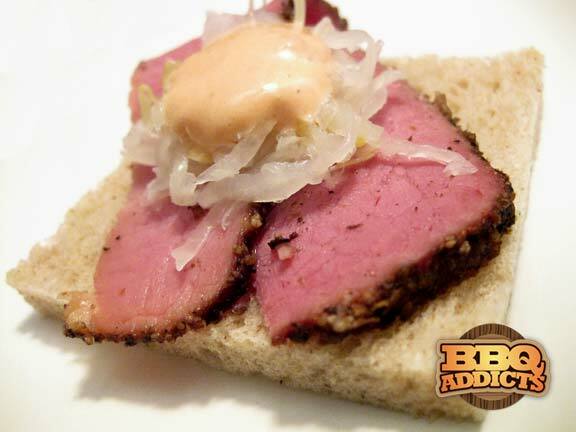 Once the corned beef brisket reaches 165 degrees, it’s now fully cooked and officially pastrami. The only problem is the meat isn’t all that tender quite yet. Due to the corning process, pastrami will never be as tender as barbecue brisket, but we still want to eliminate that chewy texture. As I learned from Marc Summers on a recent episode of Unwrapped, the famous pastrami delis in New York accomplish this by placing the meat on large steam tables before serving. Since not everyone has a steam table lying around the house, this process can be easily replicated by using a pressure cooker. The pastrami we had was too large to fit into the steam basket, so we resorted to cutting it in half. Not the ideal approach, but it sure beats buying a steam table. 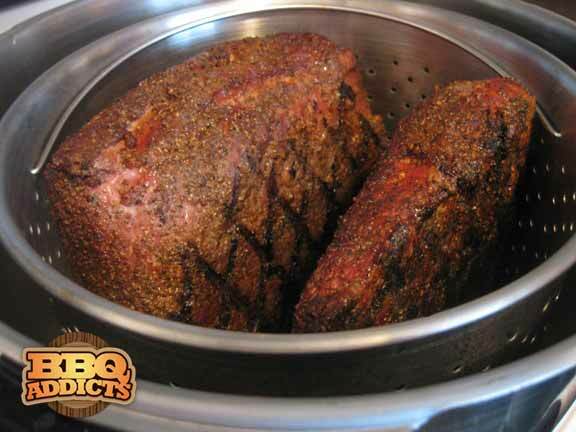 Steam the pastrami in the pressure cooker until it reaches an internal temperature of 205. Once again the cooking times will vary for each cut, so we’ll want to take a temperature reading after 20 minutes. Pressure cookers are known for drastically reducing cooking times, so we want to keep a close on our pastrami to make sure we don’t overcook it. Once it reaches the desired temperature, remove it from the steam and let it rest on a cutting board for about 10 minutes before slicing. As with any brisket, we always slice against the grain of the meat. And being that pastrami is naturally a tough cut of meat, we also want our slices to be as thin as possible. If you have access to a mandolin style deli slicer , then this is definitely the time to put it to good use. If you aren’t so lucky, then we highly recommend using a nice electric knife in place of your standard kitchen knives. A traditional pastrami sandwich is piled high on rye bread and topped off some whole-grain mustard, but I prefer a pseudo-rueben style sandwich with pastrami, kraut, and thousand island dressing. Whichever style you use, just make sure it’s washed down with a pint of Guiness Stout!!! I have always wanted to try this. The only corned briskets I can get in Nashville are just flats. So I will have to corn the thing myself. that is a nice looking flat. I just thought you had trimmed it up nice, but now I see there is no point. the ones that I see at the store are 2-4 pounds. @Ulika – the one pictured is a 5 pound flat, so it’s a little bigger than the norm. I had to dig through a couple cases to find one that big. I have a smoker but no pressure cooker. Are there any alternatives to that step? What about just keeping it in the smoker but with smoke off until it reaches 205? @Eric -If you are going to cook it on the smoker the entire time, try wrapping with foil to get the steam effect. It will take longer than the pressure cooker, but should yield similar results. These look fantastic and your photo is just beautiful. i’m meat lover..
Nice job. For those wondering pastrami is a brined beef brisket that is smoked before boiling. Corned beef is just boiled. 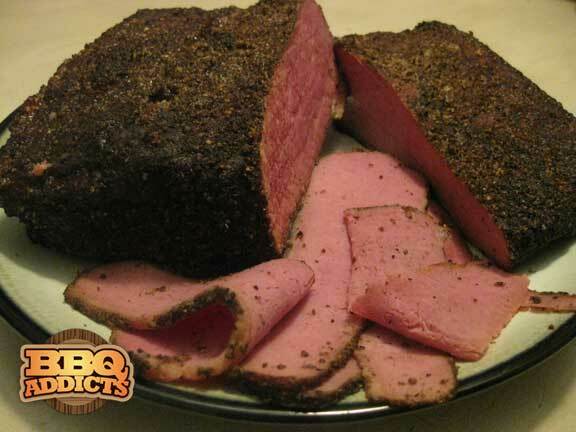 Pastrami tends to be spicier than Corned Beef thanks to a rub of black pepper on the surface. This is a perfect example of pastrami. Really, a great job here. @Stuart – Thanks for the praise! We really love this recipe, and it’s a definite crowd pleaser!! !